We supply imported vinyl self adhesive sheets. 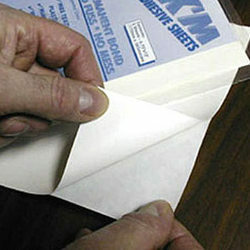 These gum sheets are available in standard sizes of 20" x 30". We supply matt vinyl gum sheets with release of 60 gsm to 120 gsm. We supply matt vinyl self adhesive sheets which is non glossy from one side. These matte vinyl gum sheets are available in all varieties. These matt vinyl self adhesive sheet is used for making vinyl labels, non tearable labels, water proof labels. These matt vinyl sheets are of non glossy, non tearable, water proof. This can be used in product labels, barcode labels etc. These are also called polyester lables sheets or rolls, labels films etc. These are self adhesive polyester labels and pvc labels films. Established in the year 2008, at Delhi (India), we “Star Paper Sales”, are one of the leading names, engaged in importing, trading, distributing and supplying a wide range of Printing & Writing Papers, Specialty Papers, Kraft Papers, Thin Papers, Kraft Boards, Packaging Boards, Label Adhesive Rolls, Paper Rolls, Paper Sheets, Stock Lot Films. In our wide range of products, we offer LWC Papers, Standard Newsprint Papers, Art Paper Rolls, Matte Papers, Tyvek Papers, Tissue Papers, Carbonless Papers, A4 Copier Papers, Release Papers, Thermal Papers, Kraft Liner Papers, Semi Kraft Papers, Bleached Kraft Papers, etc. We procure our products from trustworthy and reputed vendors of the industry. These products are imported from Germany and many other European Countries. These products are extensively used for printing, packaging and crafting purpose in various industries. Further, these products are highly appreciated by our clients for their features like high strength, fine finish, eco-friendliness, lightweight, smooth texture, tear resistance, superior gloss and durability. We offer these products in different sizes, colors and finishes as per the specifications provided by the clients.